Water damage can compromise your house in any number of ways; from burst pipes or leaky hot water heaters to cracked hoses on washing machines and failing sump pipes. When it happens it’s almost always a BIG problem. The good news is that a lot of flooding issues can be prevented, so let’s go over a few ways you can protect your home and prevent water damage in the first place. The first step to keeping water from seeping into your home from the outside is to clean your gutters. Your gutters form the first line of defense to keep water out of your home, but if they’re clogged up with leaves and branches they cannot do their job properly. While cleaning your gutters you should also inspect your roof for damaged shingles, soft spots, or cracks in sealants around skylights. All of these are ways in which water can enter your home and cause damage on the inside. Damage to your home isn’t always just the big puddles you see; sometimes it’s other issues that build over time. This could be damage to your foundation and siding caused by water being improperly directed away from the house. As a way to avoid that damage, in addition to cleaning the gutters, you want to make sure that downspouts direct water at least 5 feet away from the home and that the ground against your foundation is graded in such a way that water flows away from your house. Another preventative task you can do to prevent water damage is to check pumps and hoses, starting with your sump pump. Your sump pump only really works during a storm, making it likely to be forgotten completely—that is until you need it. Your home depends on it working, so doing a test before the storm season is your best bet. You should check on your sump pump at least once a year to make sure your home is fully prepared. While you’re checking on that sump pump make sure you know where the water main shut off valve is located. In case of a leaky pipe emergency you’ll want to get to it, and fast, to prevent water damage that can get extensive. After checking the pump you’ll want to check the hoses in your house. Checking these for small leaks or loose connections can alert you to bigger problems that may be coming down the road. Insurance claims for flooding won’t pay out if the problem was something you could have seen coming such as a loose hose connection on a sink or toilet. Make sure you look under every sink, around the toilets, and around your washer and hot water heater to be sure everything is dry and functioning properly. These areas are all common places for water damage issues to begin and places that are easy to address once you find them. Your water bill can alert you to water leaks you may not realize are happening, such as leaking sprinkler systems that can flood your foundation. If your bill is unexpectedly high that may be a sign of water losses you should be hunting down before they cause extreme damage to your home. Signs of leaky pipes range from the obvious, such as dripping water, to the not so obvious, like dark spots and stains. Leaking water from pipes can cause more than the obvious water damage; the water can also attract insects such as ants and termites that can cause a whole other kind of headache. If you do find a leak, make sure to address the problem quickly. 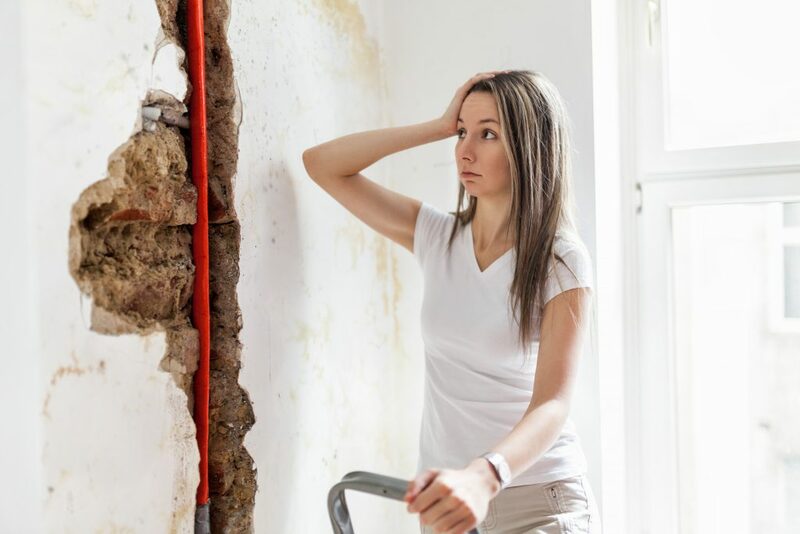 You may not want to pay the initial cost of a plumber to handle the issue, but the fallout from extensive water damage can cause you to require a lot more than a plumber to fix the job!